Want to know why Blue Star Ointment is the best ointment for you? Can I use Blue Star Ointment for my child’s ringworm treatment? Yes! Blue Star Ointment immediately soothes the irritation of ringworm and cures it within three to five days, with regular application. Our proven formula is safe for children and can be diluted with petroleum jelly for use on especially sensitive skin. Does Blue Star Ointment contain relief for jock itch and athlete’s foot? Yes! Blue Star Ointment is a powerful antifungal cream, which not only instantly relieves the itching, cracking and irritation that come with these pesky infections but also cures them in three to five days with regular application. Does Blue Star Ointment treat mosquito bites? Yes! Our all-purpose itch treatment relieves the pain and itching caused by the bites of insects including mosquitos. What about my dry skin? The thickest moisturizers are the best. That’s why Blue Star Ointment is the ideal dry skin cream. Apply it to dry skin two to three times a day, and always after bathing. Blue Star Ointment’s soothing menthol aroma lets you know it’s working. But while the smell fades quickly after application, Blue Star Ointment’s soothing and healing powers last much longer. Can I buy Blue Star Ointment online? Of course! 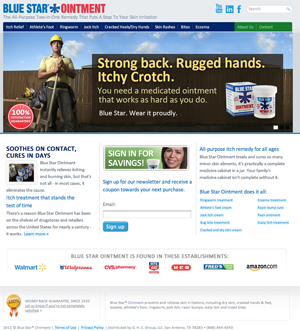 Click here for the list of stores and websites where you can buy Blue Star Ointment. What size does Blue Star Ointment come in? Blue Star Ointment comes in a two ounce jar. You can find our jars in retailers, grocers, and drugstores across the United States. Your medicine cabinet isn’t complete without it! How can I stock Blue Star Ointment in my store? Call us today, toll-free at (888) 844-4043, for information on purchasing Blue Star Ointment. We will be glad to answer your questions and talk to you about joining our family. Our offices are open 9am-4pm CST..